In a time when the existence of the Force was first unveiled, initiates of the Force forged weapons from metal and crystal, melding them together and imbuing their creation with the Force and part of the forger's spirit. This was done not only to construct a powerful weapon, but also to prove their skill and commitment to the way of the Force. After millennia of this practice, the advancement of technology gave birth to the protosaber, the progenitor of the modern-day lightsaber. This weapon combined the usage of the special crystals originally used in the forging process of Force-imbued weapons, with technology contemporary to the time. All in order to have a weapon capable of defeating those wielding blasters and force weapons alike. 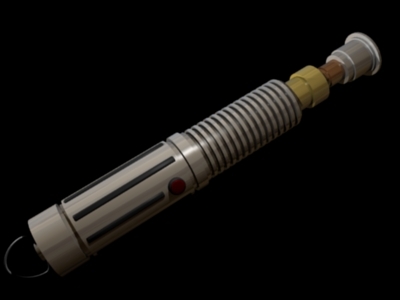 However, the protosaber required large amounts of energy to function and needed a belt-mounted power supply, which limited the movements of the user. This limitation relegated the protosaber to being a siege weapon, as it could be easily matched with more dependable, though less advanced weapons that allowed full movement of the user. Two thousand years later, technology advanced once again with the lightsaber finally taking its modern-day form. A blade of pure plasma, without the drawbacks of the protosaber, it is capable of cutting through nearly any substance and deflect almost any attacks made by blaster wielding opponents. These enhanced capabilities are primarily due to a miniaturized power supply that is small enough to be placed into the hilt of the lightsaber, rather than on the belt of the user. Considered an elegant and devastating weapon, the lightsaber is a symbol of the Force and the force-sensitive beings capable of wielding it. Like the forging of the ancient, force-imbued weapons, the act of crafting a lightsaber allows an initiate the opportunity to construct a weapon that represents who they are and prove their skill and commitment to the path they have chosen. No matter the type of lightsaber a force users chooses to craft, the type of components that are required remains the same; a power supply, an activation switch, a blade emitter, a hilt and a focusing crystal. The components of the lightsaber serve as a way to generate, control and focus the energy produced by the power supply into a blade of weightless plasma. The power supply generates electricity through a chemical reaction, which is then channeled into the focusing crystal. The focusing crystal concentrates the electricity into a narrow beam, which is converted into plasma as the energy passes through a series of focusing lenses, cycling field energizers and energy modulation circuits. Finally, the blade emitter further focuses the plasma into a weightless, mass-less blade and is responsible for arcing unused energy back into the lightsaber, for it to be converted back into electricity and stored within the power supply once again. All of these mechanisms are contained within the hilt, which aligns and holds them in place, with the process being controlled by the activation switch. The Force is capable of aiding an initiate with the process of selecting components, those that are important to the individual and that mirror their inner self; such as the aspects that express their beliefs and customs as well as their emotions and ambitions. Should an initiate feel a strong connection toward a hilt made from a rancor tooth for example, then they should heed the subtle hint, as these strong connections will allow them to craft a unique weapon that is truly an extension of their very being. Once acquired, an initiate needs only to assemble the components, though the process requires absolute concentration and time. If the initiate fails to identify imperfections or align the parts properly, then the lightsaber may malfunction or even explode, requiring the initiate to start the process over. The blade of a lightsaber can cut through nearly any substance and can be difficult to wield proficiently, especially by those that do not have a connection to the Force. In unskilled hands it poses a threat to everyone, including the wielder, but in the hands of a master, the lightsaber becomes a source of immense power. For this reason, it is a rare for a non-Force user to be in possession of one, with most being kept in these hands as a symbol of power, honor or prestige.